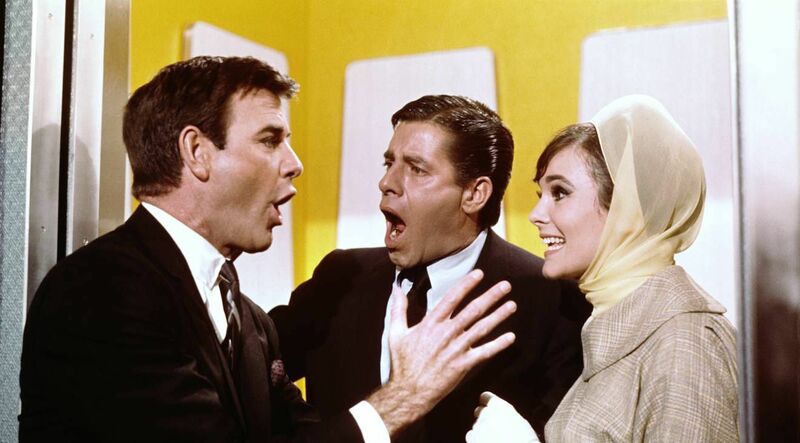 Jerry Lewis, who had spent the first part of his directorial career cha-cha-ing down the narrow division between notions of the self and the other, seemed to have reached an impasse with 1965’s The Family Jewels, in which he split his psyche into no less than seven pieces. Though some were more or less recreations of previous incarnations (Kelp v.2.0), probably the most tenuous role was that of Willard, whose role in the film was more or less an eccentricity solvent, to be held against the six other unsuitable guardians. That is to say, the film seemed to indicate a widening gulf between the models of self and other. Three on a Couch, his moving and discernibly reassured follow-up (and his first film as a director away from Paramount Studios), doesn’t restore order to Lewis’s outline, but instead coasts on the resultant psychological furrowing. The film’s “Willard” equivalent, Christopher Pride, has been offered the chance of a lifetime to make his mark as an artist after being commissioned to paint a mural in Paris. The problem is that his fiancée, psychiatrist Elizabeth Acord (one of the more deliciously parseable names in a brimming collection of covertly, but far from subversively, symbolic Lewis character nomenclature), can’t just up and leave her patients in the middle of their therapy, especially the three young women with more advanced stages of romantic avoidance. Lewis portrays Chris as a straightforward, if perhaps a tad pushy, gentleman, whose almost impeccable sense of control (or, perhaps more accurately, his sense of entitlement surrounding his need for control) is shown under an increasing duress. Not so much because Elizabeth isn’t properly bowled over by his professional and artistic coup—she is, and Janet Leigh is frequently asked to bend over backward and shimmy for happiness—but because his even attempt to maintain command is not enough to preserve his sense of direction. And Three on a Couch is a film that flies any number of directions. (Like The Patsy and The Nutty Professor, the film seems to switch genres with the change of every scene.) One reason that it ends up being among his most fully satisfying films (aside from having one of the most uniquely organized uses of color cinematography in his entire body of work—contrasting Chris’s apartment’s panoply of combinations and patterns with the monochromatic psychotherapeutic lights in Elizabeth’s office), is its sweet and sour tendency to find a cosmic relationship between utter chaos and insistent stasis. (Not to say that this wasn’t always a Lewis trait, but perhaps it took a pair of outsider scripters to allow Lewis to focus his vision.) Chris reasons that if he can manipulate Elizabeth’s three frigid patients into falling in love by playing laughably to their own romantic prejudices (i.e. for one, he impersonates a fitness nut; for another, he’s an affluent and somehow world-renowned ranch owner; the third, he’s a poky anthropologist…oh, and his sister), he can ultimately manipulate Elizabeth herself into domestic obsequiousness. Most of Lewis’s films at least reference maladaptive psychology, but very few of them paint so compelling a portrait of blithe denial. The comic disparity between what Chris is attempting to manipulate and what he is capable of harnessing builds slowly up to the spectacular surprise party at Elizabeth’s office upon her decision to leave with Chris to Paris. Given that the three women to whom Chris has pitched woo in various guises are present at the party and Elizabeth is hellbent on getting all three to pay witness to her paradigm of pre-wed bliss (interestingly, Chris isn’t the only character whose good intent is on a collision course with a disastrous aftermath), the absurd mosh-pit density of the gathering crowd becomes a terrifying conceptual representation of Chris’s unraveling grasp on his own plan. One extraordinarily effective shot gives us Chris’s point of view as he waits (and waits) for an elevator door to open: as he looks over his shoulder, the teeming throng embodies a swarming chaos, but we see the three distinct figures of his soon-to-be-spurned faux-girlfriends calmly closing in on him, working almost nightmarishly against the grain of the masses. A spiritual perversion of one of the film’s earlier (and most magical) sequences when Lewis and Leigh dance in a ballroom with a beautiful, dreamy lassitude (Lewis’s back to the camera and Leigh’s enraptured eyes looking heavenward as the two glide on an arc of rapture), Three on a Couch‘s rousing climax ultimately seals the film’s portrait of a total filmmaker’s fear of jurisdiction gone astray.